This, right now, is my FAVORITE breakfast. It's like a chocolate chip cookie. I've never been able to get into oatmeal. I wanted to but...I don't know...it just never has really done it for me. However, I do like oatmeal when it's baked in stuff (like cookies, for instance). So, I was open to the idea of baked oatmeal. But, baked oatmeal usually has like...fruit and stuff in it. I don't really enjoy baked fruit (unlike Michael and his love for fruit pie). 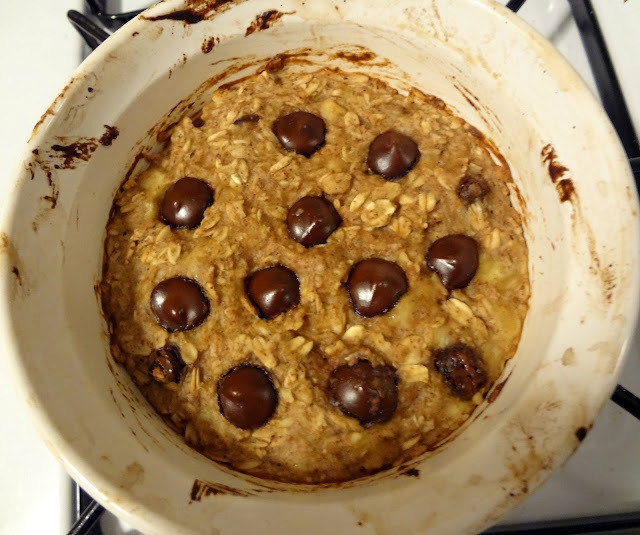 Then, Chocolate Covered Katie tempted me with "Cookie Dough Baked Oatmeal". Um, yum. It looked super promising. I fell in love. I don't really think it tastes like cookie dough. However, I DO think it tasted like an oatmeal chocolate chip cookie! I feel like I've made this like 30 times since then, and with time I perfected it to the way I like it. But the beauty is-you can mess with it to see how YOU like it too! AND it is gluten free, and can be sugar free, soy free, dairy free, and fat free. YEAH. It makes a single serving, and is low calorie, and, in general, just a really healthy way to start your day. So if you're still hanging on to a healthy New Year's resolution, this is for you! Optional:Cinnamon-a pinch, or more, to taste. (I like to use it-more than a pinch, it adds some flavor and it's full of antioxidants). Optional: Sweetener, 1 1/2 tbsp. agave or maple syrup OR 1-1 1/2 packs Stevia (I used to use agave syrup but now I omit, I really don't think it needs it). Optional: 1-2 tbsp. oil (if using oil, scale back the liquid in the next ingredient. ), vegan butter (if using vegan butter use less salt), or nut butter (I like to use natural peanut butter)--If you omit this you're looking at a fat free and extra low calorie recipe, but I think it would taste pretty bland. 1/4 cup milk, creamer, juice, or water (I just use water). Pour into a small baking/loaf pan or ramekin (or 2 smaller ramekins) that is/are sprayed with non-stick spray. Bake for 20 minutes-until firm. Then set your oven to broil for 3-5 minutes to form a crust, or just continue baking at 380 for the 3-5 minutes. You can turn the pan/ramekin upside down and pop the "cake" out and eat, or, if you are like me, just eat it straight out of the pan/ramekin. im usually not a fan of oatmeal, but these pictures are making me want some right now! I'm not usually an oatmeal fan either, but this is so good! I need to start adding chocolate to my breakfast, love this! omg!! This looks so good! I have to try this!!! I've been looking for ideas to make my oatmeal more edible! lol... Good job! It is delicious I promise!!! I'd love it if you'd come by Themed Baker's Sunday and share your treat! This week's theme is cookies! Made these this morning and used a muffin pan! Delish with some coffee!